In a sign of "humility and service," the Argentine pontiff has washed the feet of refugees from various religious backgrounds. One of the asylum seekers said he felt "more important than Obama." Pope Francis washed the feet of 11 Muslim, Orthodox, Hindu and Catholic refugees and one aid worker at a shelter for asylum seekers as part of traditional rituals held on the Thursday before most Christians celebrate Easter on Sunday. The "washing of the feet" ritual represents a "gesture of humility and service" that reflects the moment Jesus washed his disciples' feet in chapter 13 of the Gospel of John, according to the Vatican. "All of us together - Muslims, Hindus, Catholics, Copts, Evangelicals - but brothers, children of the same God, who want to live in peace, integrated," the pope said in unscripted comments, according to Reuters news agency. "Three days ago, there was a gesture of war, of destruction, in a city of Europe by people who don't want to live in peace," he said, referring to attacks in Brussels that left more than 30 people dead. "Behind that gesture, there were arms manufacturers, arms traffickers, who want blood, not peace, who want war, not brotherhood." The pope, who has championed refugees' rights in Europe at a moment of growing anti-migrant populism, has called on European leaders to do more for refugees and migrants, many of whom are fleeing war in the Middle East, Asia and Africa. "Washing the feet of the refugees, Pope Francis demands respect for each one of them," wrote Archbishop Rino Fisichella earlier this week. Angelo Chiorazzo, who founded the charity running the shelter outside of Rome, told Vatican Radio that the asylum seekers were looking forward to the ceremony. "One of the boys [at the shelter], a Muslim from Mali, told me: 'I really feel more important than [US President Barack] Obama. That the pope, the most important in the world - the best man in the world - will wash my feet," said Chiorazzo. 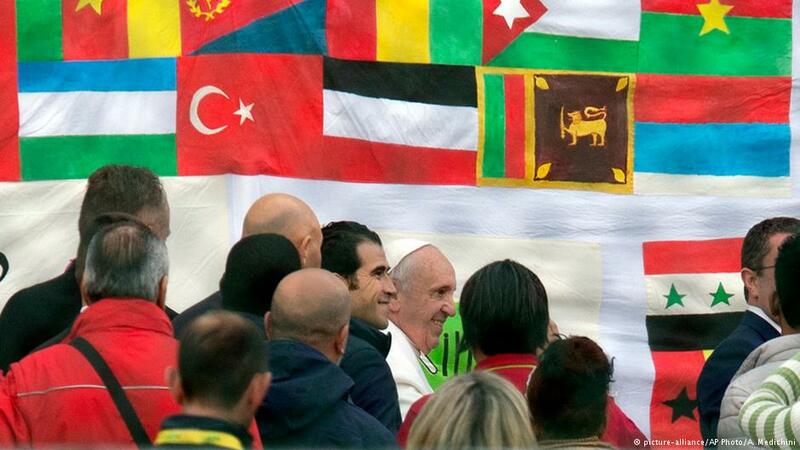 After the ceremony, the pontiff individually greeted many of the nearly 900 asylum seekers residing at the shelter. Look for a softening of finger pointing and an awakening of new tolerance. There will remain many systems for different cultures, as traditions and history are important to sustaining the integrity of culture. So there are many in the Middle East who would follow the prophet and they will continue, but with an increase of awareness. It will be the increase of awareness of what the prophet really wanted all along - unity and tolerance. The angel in the cave instructed him to "unify the tribes and give them the God of Israel." You're going to start seeing a softening of intolerance and the beginning of a new way of being. Eventually, this will create an acknowledgement that says, "You may not believe the way we believe, but we honor you and your God. We honor our prophet and we will love you according to his teachings. We don't have to agree in order to love." How would you like that? The earth is not going to turn into one belief system. It never will, for Humans don't do that. There must be variety, and there must be the beauty of cultural differences. But the systems will slowly update themselves with increased awareness of the truth of a new kind of balance. So that's the first thing. Watch for these changes, dear ones. ...."